From time to time I take a closer look at the “sales” numbers of our products at RPGNow. I put sales in quotation marks, because all the products are of course for free. The numbers are not really accurate, since some of the PDFs are also available through Scribd and my Google Docs account. So take these numbers with a grain of salt. I won’t bore you with all the numbers here, but if you are interested in seeing all the details, I’ve made them available as a Google Docs spreadsheet here. What I want to talk about today is what I found out looking at these numbers. When you look at download totals WR&M is the most popular product, but if you look at the monthly averages, Jay Steven Anyong’s BADASS wins this particular title. 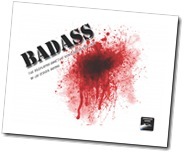 BADASS was hugely popular in the first two or three months since release. 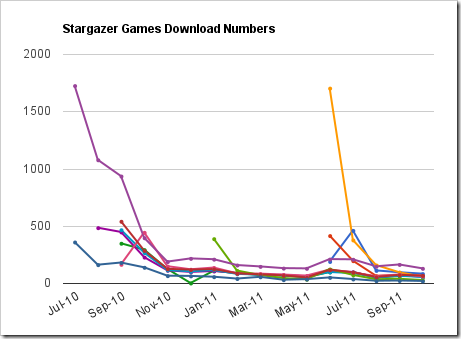 But on the long run I think WR&M will remain the strongest Stargazer Games’ title. It has been downloaded at least 6151 times since its release in July 2010. What makes me a bit sad is that Resolute, Adventurer & Genius is obviously among the least popular products. And that’s a real shame. RAG written by Andrew Modro and Jason Cabal is a great game that is not only better looking than WR&M but also fixes a lot of the issues the first iteration of the Wyrm system had. But it seems fantasy is just much more popular than pulp will ever be. I also believe we should have done much more “advertising”. Overall I am very happy with the success of all the products we’ve released. There’s not one game that hasn’t been downloaded at least 800 times in only a few months and especially the interest for Warrior, Rogue & Mage is still very strong. What does this mean for the future? I think some more support for our current games would be in order. A while ago I mused about a setting book for Resolute, Adventurer & Genius. This could be a fun project and also raise interest in the game again. Even though a lot of people urge me to write more stuff for WR&M I am not sure if I want to do so at the moment. Yes, it’s highly popular, yes it’s still my “signature game”, but personally I want to work on new projects at the moment. Arcane Heroes is another game that was done in a few hours but has shown a huge potential. More than once I have thought about expanding it to a full game with a complete setting, revised rules and more stuff for you to play with. 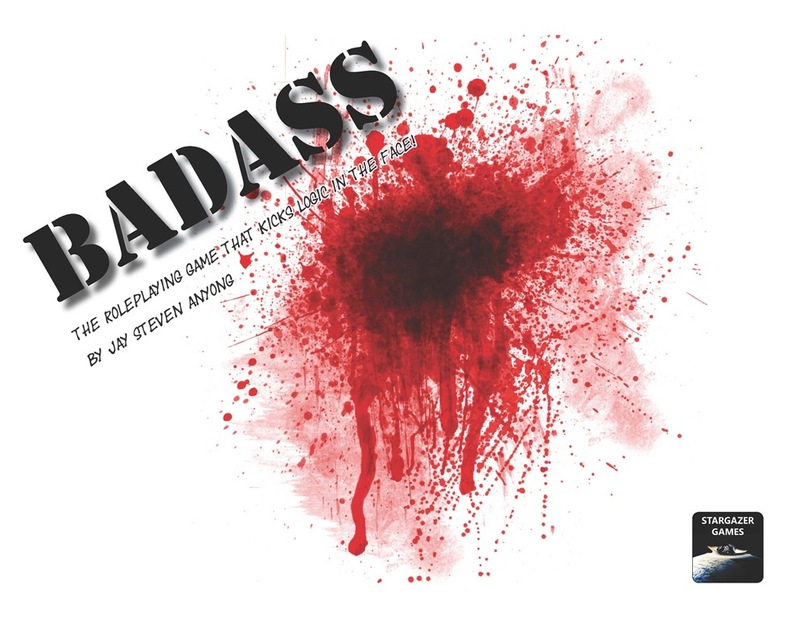 Up to this moment Jay Steven Anyong’s RPG BADASS has been downloaded 1322 times. This is a huge success and we have decided to give you a little gift. 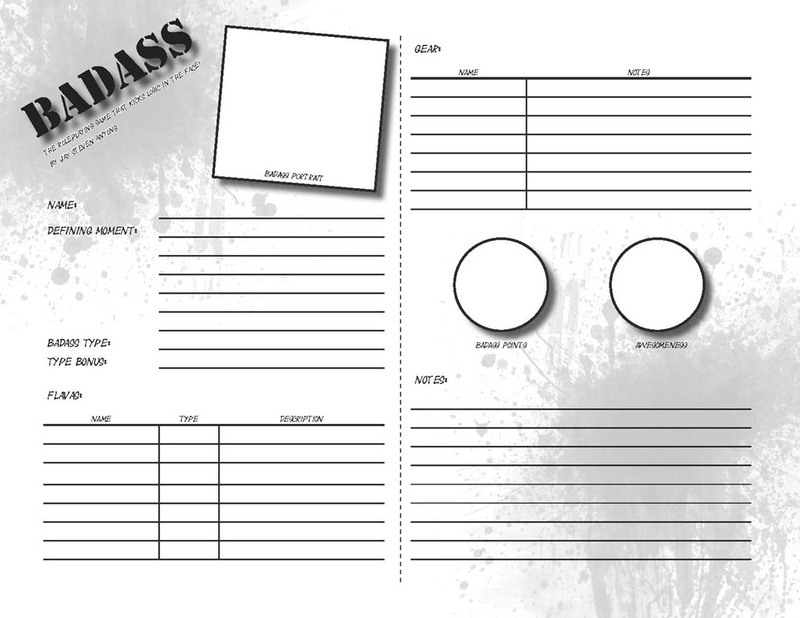 Don’t worry, it’s not a cake – which is a lie anyway – , but an awesome BADASS character sheet. In addition to that, there’s finally an official BADASS page here at Stargazer Games. Check it out now! Ready to become the BADASS you always dreamed to be? Stargazer Games and Jay Steven Anyong, the Philippine Gamer, are proud to announce the release of BADASS, the game that kicks logic in the face, twists its arm behind its back and makes it cry for its momma. It makes me tremendously proud that Jay asked me not only to do the layout for his game but also wanted me to release it as a Stargazer Games product. The 28-paged PDF is available for FREE from DriveThruRPG. So, what are you waiting for? Download the PDF and become the Badass you always wanted to be!